I know that the month of November is usually reserved for “thankfulness” but I just felt the need in my heart to be reminded that no matter what the circumstance we are thankful women, moms, and children of God. We are thankful even when things don’t seem easy, or convenient, or go the way we wanted. But we are thankful because we know God who is in-charge. We are thankful when our kids don’t mind, or make not good choices, or hit their siblings. We choose an attitude of thankfulness because there are women who desire and long for the messy days that come our way. We can be thankful in the mommy tiredness, with the to-do list that never ends, and with the house that is never clean knowing we have children that have been given to us as a gift. A GIFT! Think bigger than Christmas kind of gift. You can download your April Printable To Do List here or from Google Drive. 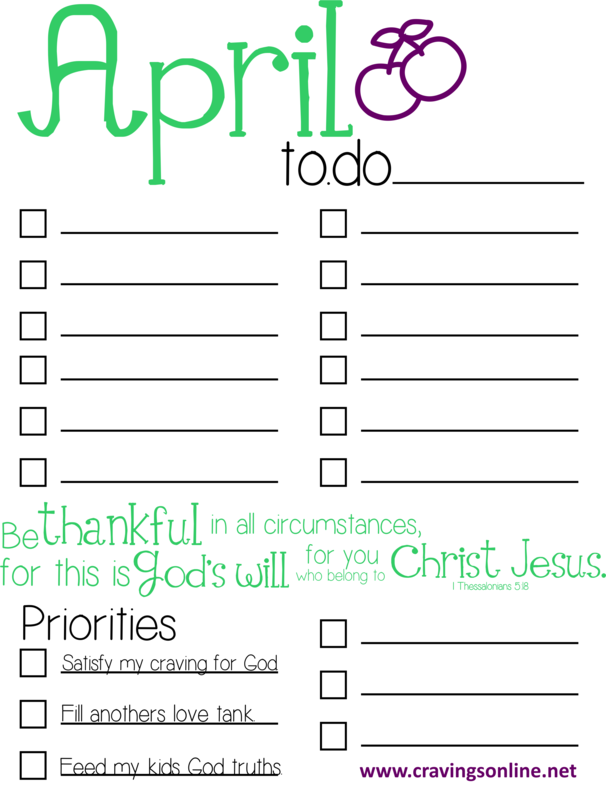 I have added a “Priorities” section to the To-Do list so that we can be reminded that in each day our hope is to satisfy our personal craving for God, fill up anothers love tank, and feed our kids God truths! How will you do that this week? You can download your April Memory Verse Cards here or from Google Drive.